The store we stumbled on during our search for an umbrella turns out to be one of the most interesting places we’ve come across during our short time in Bangkok. Huge in relation to other shops nearby, this retro department store stocks everything from old musical instruments to hair rollers. Old posters, plastic furnitures, boxy women underwears.. it feels like I’ve stepped into a 1960s movie set. 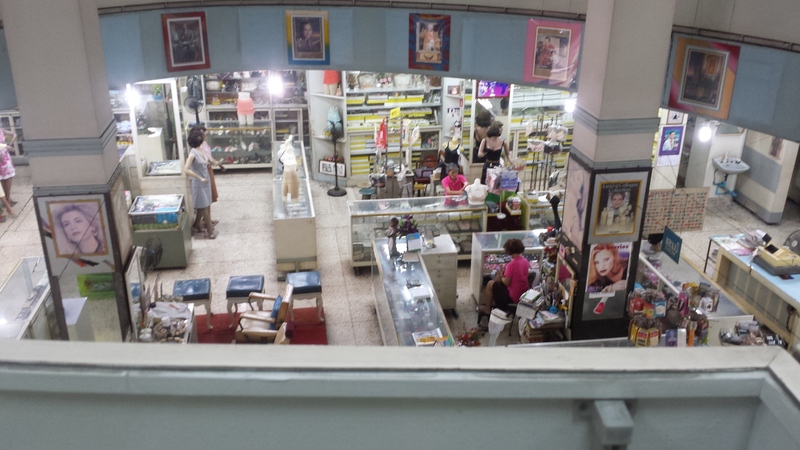 Despite it’s quirkiness and randomness, the two storeyed store is eerily empty of customers. A staff in pink T-shirts firmly shake her head when I ask if I can take some photographs, so I make do with a discreet picture with my phone instead. By the time we finish looking around and step outside again, the rain had stopped. 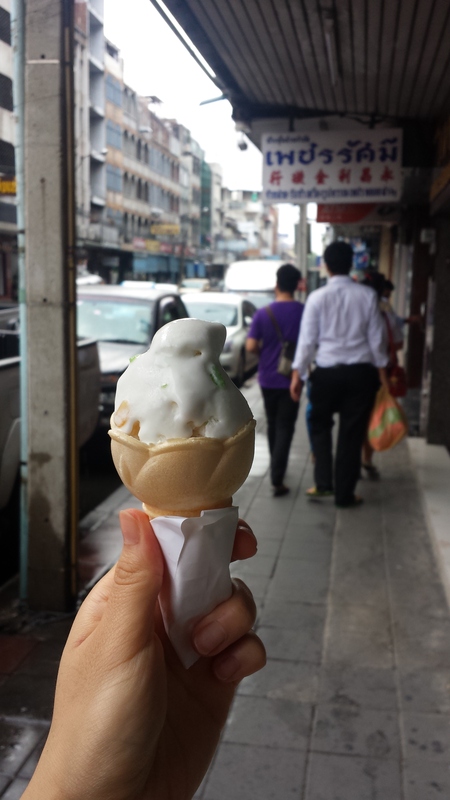 I buy my first Thai street food from the very first vendor that passes in front of me, which turns out to be sweetcorn ice cream. It tastes like cheap vanilla ice cream with a hint of nutty flavour, with bits of yellow sweet corns. The green bits, I cannot work out what they are. Wat Pho is one of the must-see places in Bangkok, but the street by its entrance gate is strangely quiet. Two Thai men are idly sitting under a tree shade, and when they see us approaching, one of them walk eagerly towards us with a big welcoming smile. “Hello! Where are you guys from?” He latches on with series of over-friendly questions. “Are you guys travelling? Where are you going now? Wat Pho?” Then he pulls out a tourist map from his back pocket in his jeans and starts talking and talking. I can tell my friend is giving him only brief acknowledgements and trying to walk away, but I find it difficult to cut him off when he’s being so friendly. It feels too rude. Eh? The website said Wat Pho’s official closing time is 3pm. “Instead you can go here, then see a temple there, and then go here.” He circles a few places on the map with his biro. Even before he finishes his sentence, a tuk-tuk conveniently pulls in next to us out of nowhere. Only then I manage to say no and walk away while my friend makes fun of me being so receptive to such an obvious sham. “Textbook.” My friend tut tuts. Later on the trip, we find a sign warning tourists not to fall for scammers that claims a major tourist attraction has closed early.